I forget what number I’m on and I’m too lazy to go back and look. Anyways… It’s time for the entryway! 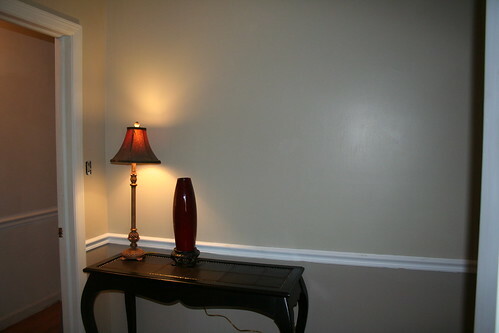 I actually just finished painting it so there isn’t anything on the walls (nor is there a new light fixture) but I figured I’d put up some pictures anyways. You gotta love that light fixture. And the previous owner was so kind- she left and entire plastic cup full of little hangydown things so I could add to them. Or not. 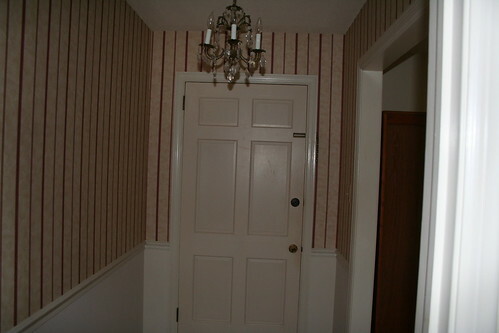 Not sure why the door looks pink there. Hmmm. 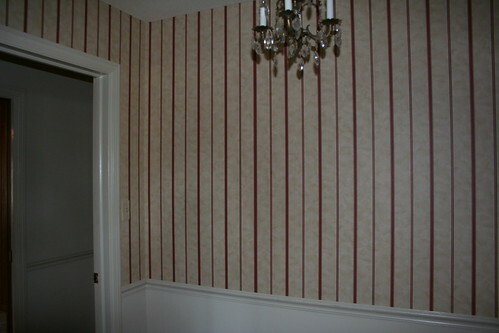 So we took down the wallpaper (it was actually the first thing we did when my sister was here I believe) and got it primed- including the door. I think the top color (both are Valspar) is called Oatbran and the bottom is called Ivory Brown. After much deliberation I let the chair rail the bright white and I think it looks quite nice with it. I haven’t painted the door yet but it will be the same bright white as the chair rail. And the doorknob will match the deadbolt which is oil rubbed bronze. I’m still looking for a new light fixture. I want to find one that is a smaller version of one that will look good in the dining room as well. The hunt continues! The table is from Pier1. I found it hiding in a corner and it was on sale so it wasn’t hard to convince the husband which is always a plus. I love it. 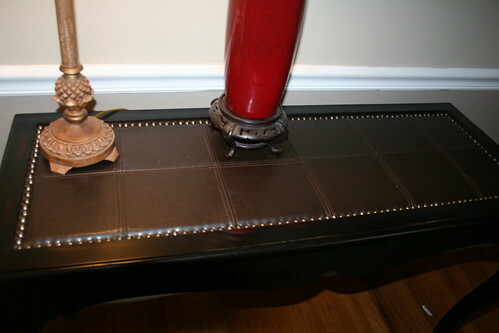 It is a dark brown with a leather inset on top. So that’s the entryway. I’m taping off the living room tomorrow (using a sprayer because it is a bigger room and there is no chair rail so I can just spray away!) and hopefully I’ll have pictures of that in the next week or so. 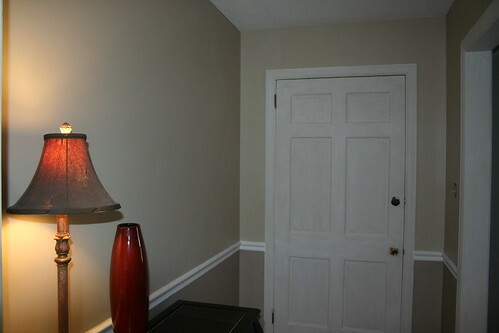 This entry was posted in Uncategorized and tagged entryway remodel, oil rubbed bronze, Pier1, This Ugly House, Valspar Ivory Brown, Valspar Oatbran. Bookmark the permalink. 3 Responses to This Ugly House #? I love the colors you chose. And the table is pretty awesome, too! That looks sooooo much better! Great colors and love the table! Good job!